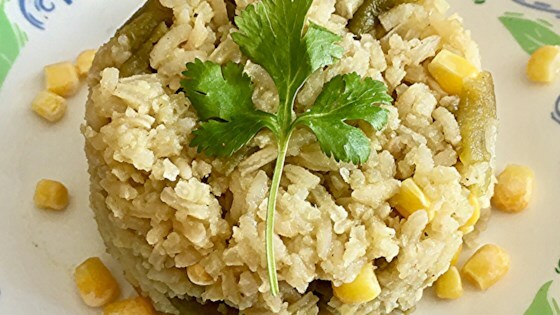 "I did a little twist to traditional green rice (arroz verde) where I used brown rice and added corn to it so it becomes a much more filling side dish. You can just omit the epazote, which is hard to find here (look in Mexican markets)." Cover brown rice with hot water and soak for 1 hour. Drain and rinse. Heat 2 tablespoons oil in a saucepan over medium heat. Add rice and corn kernels and cook until rice is lightly browned, about 3 minutes. Heat remaining 1 tablespoon oil in a large pot and cook onion and 3 poblanos until they have softened, about 5 minutes. Add rice and corn; mix well. Combine remaining 3 poblano peppers, 1 cup water, and garlic in a blender; blend until smooth. Pour over rice and add remaining water. Add epazote and salt; bring to a boil. Reduce heat to low, cover, and cook until all the water is absorbed and rice is cooked through, about 45 minutes. Remove the rice from the heat and let stand, covered, for 10 minutes before serving.